My so-called life, MomGen, Jerla, Michelle and more awarded me with such gorgeous awards. Thanks a lot for appreciating me all the time. I'm really flattered and overwhelmed everytime you gave me not only appreciation but tags as well. God Bless! 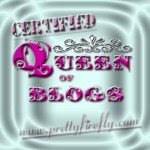 and Certified Queen of Blogs. thanks pretty girl sa mga awards..
waaaah ang tagal ko nang di nakaparito ah! sensya na po! at naku.... salamat sa award! i can't believe i am the queen! hahaha! thanks again! but if u'v voted na, ok lang! :) regards! this is my very first blog award. Thank you very much I can't thank you enough...this inspires me to blog more interesting stories/ infos. how are you!This was a really brilliant Topics!